False doctrine updated: 14th January Dialogue Concerning the Two Chief World Systems by Galileo Galilei (1632) The open-minded and lettered Sagredo in Galileo's dialogue was a close friend of the scientist. Salviati represents the views of Galileo himself. Simplicio, the philosopher, is a fictitious straw man. Kepler to Galileo, 1597 I could only have wished that you, who have so profound an insight, would choose another way. You advise us, by your personal example, and in discreetly veiled fashion, to retreat before the general ignorance and not to expose ourselves or heedlessly to oppose the violent attacks of the mob of scholars (and in this you follow Plato and Pythagoras, our true perceptors). But after a tremendous task has been begun in our time, first by Copernicus and then by many very learned mathematicians, and when the assertion that the Earth moves can no longer be considered something new, would it not be much better to pull the wagon to its goal by our joint efforts, now that we have got it under way, and gradually, with powerful voices, to shout down the common herd, which really does not weigh the arguments very carefully? Thus perhaps by cleverness we may bring it to a knowledge of the truth. With your arguments you would at the same time help your comrades who endure so many unjust judgments, for they would obtain either comfort from your agreement or protection from your influential position. It is not only your Italians who cannot believe that they move if they do not feel it, but we in Germany also do not by any means endear ourselves with this idea. Yet there are ways by which we protect ourselves against these difficulties... Be of good cheer, Galileo, and come out publicly. If I judge correctly, there are only a few of the distinguished mathematicians of Europe who would part company with us, so great is the power of truth. If Italy seems a less favorable place for your publication, and if you look for difficulties there, perhaps Germany will allow us this freedom. Galileo to Kepler, 1610 My dear Kepler, what would you say of the learned here, who, replete with the pertinacity of the asp, have steadfastly refused to cast a glance through the telescope? What shall we make of this? Shall we laugh, or shall we cry? Dialogue Concerning the Two Chief World Systems, 1632 To this end I have taken the Copernican side in the discourse, proceeding as with a pure mathematical hypothesis and striving by every artipee to represent it as superior to supposing the earth motionless–not, indeed absolutely, but as against the arguments of some professed Peripatetics. These men indeed deserve not even that name, for they do not walk about; they are content to adore the shadows, philosophizing not with due circumspection but merely from having memorized a few ill-understood principles. Papal Condemnation of Galileo, 1633 We say, pronounce, sentence and declare that you, Galileo, by reason of these things which have been detailed in the trial and which you have confessed already, have rendered yourself according to this Holy Office vehemently suspect of heresy, namely of having held and believed a doctrine that is false and contrary to the divine and Holy Scripture: namely that Sun is the center of the world and does not move from east to west, and that one may hold and defend as probable an opinion after it has been declared and defined contrary to Holy Scripture. Consequently, you have incurred all the censures and penalties enjoined and promulgated by the sacred Canons and all particular and general laws against such delinquents. We are willing to absolve you from them provided that first, with a sincere heart and unfeigned faith, in our presence you abjure, curse and detest the said errors and heresies, and every other error and heresy contrary to the Catholic and Apostolic Church in the manner and form we will prescribe to you. Furthermore, so that this grievous and pernicious error and transgression of yours may not go altogether unpunished, and so that you will be more cautious in future, and an example for others to abstain from delinquencies of this sort, we order that the book Dialogue of Galileo Galilei be prohibited by public edict. We condemn you to formal imprisonment in this Holy Office at our pleasure. As a salutary penance we impose on you to recite the seven penitential psalms once a week for the next three years. And we reserve to ourselves the power of moderating, commuting, or taking off, the whole or part of the said penalties and penances. Abjuration of Galileo, 1633 I, Galileo Galilei, son of the late Vincenzo Galilei, Florentine, aged seventy years, arraigned personally before this tribunal, and kneeling before you, most Eminent and Reverend Lord Cardinals, Inquisitors general against heretical depravity throughout the whole Christian Republic, having before my eyes and touching with my hands, the holy Gospels -- swear that I have always believed, do now believe, and by God's help will for the future believe, all that is held, preached, and taught by the Holy Catholic and Apostolic Roman Church. But whereas -- after an injunction had been judicially intimated to me by this Holy Office, to the effect that I must altogether abandon the false opinion that the sun is the centre of the world and immovable, and that the earth is not the center of the world, and moves, and that I must hold, defend, or teach in any way whatsoever, verbally or in writing, the said doctrine, and after it had been notified to me that the said doctrine was contrary to Holy Scripture -- I wrote and printed a book in which I discuss this doctrine already condemned, and adduce arguments of great cogency in its favor, without presenting any solution of these; and for this cause I have been pronounced by the Holy Office to be vehemently suspected of heresy, that is to say, of having held and believed that the sun is the center of the world and immovable, and that the earth is not the center and moves. Therefore, desiring to remove from the minds of your Eminences, and of all faithful Christians, this strong suspicion, reasonably conceived against me, with sincere heart and unfeigned faith I abjure, curse, and detest the aforesaid errors and heresies, and generally every other error and sect whatsoever contrary to the said Holy Church; and I swear that in the future I will never again say or assert, verbally or in writing, anything that might furnish occasion for a similar suspicion regarding me; but that should I know any heretic, or person suspected of heresy, I will denounce him to this Holy Office, or to the Inquisitor and ordinary of the place where I may be. Further, I swear and promise to fulfill and observe in their integrity all penances that have been, or that shall be, imposed upon me by this Holy Office. And, in the event of my contravening, (which God forbid) any of these my promises, protestations, and oaths, I submit myself to all the pains and penalties imposed and promulgated in the sacred canons and other constitutions, general and particular, against such delinquents. So help me God, and these His holy Gospels, which I touch with my hands. I, the said Galileo Galilei, have abjured, sworn, promised, and bound myself as above; and in witness of the truth thereof I have with my own hand subscribed the present document of my abjuration, and recited it word for word at Rome, in the Convent of Minerva, this twenty-second day of June, 1633. I, Galileo Galilei, have abjured as above with my own hand. I wonder if there has been any statement regarding Galileo, or at least his ideas, by the church since 1633. In October 1992, Pope John Paul II released this statement. From the beginning of the Age of Enlightenment down to our own day, the Galileo case has been a sort of "myth", in which the image fabricated out of the events was quite far removed from reality. In this perspective, the Galileo case was the symbol of the Church's supposed rejection of scientific progress, or of "dogmatic" obscurantism opposed to the free search for truth. This myth has played a considerable cultural role. It has helped to anchor a number of scientists of good faith in the idea that there was an incompatibility between the spirit of science and its rules of research on the one hand and the Christian faith on the other. A tragic mutual incomprehension has been interpreted as the reflection of a fundamental opposition between science and faith. The clarifications furnished by recent historical studies enable us to state that this sad misunderstanding now belongs to the past. Book Review of Copernico, Galilei e la chiesa: Fine delta controversia (1820) gli atti del Sant'Uffizio by Brandmuller and Greipl. (1992) This book was the work cited by Pope John Paul II in his discourse to the Pontifical Academy of Sciences in 1992 as evidence that the Church had already reversed Galileo's sentence of 1633 against teaching Copernicanism when it granted the imprimatur for the publication of Canon G. Settele's Astronomia in 1820. Therefore, the author states, "This explains the subtitle: in that year, 1820, the Copernican controversy was effectively terminated, although it took an extensive search by the authors through the acts of the Holy Office to find that out." Also following Peter's suggestion, Googling for "imprimatur Canon Settele" brings up some interesting takes on this. Point of view: Nothing to see here The Galileo Affair - George Sim Johnston Galileo's condemnation was certainly unjust, but in no way impugns the infallibility of Catholic dogma. Heliocentricism was never declared a heresy by either ex cathedra pronouncement or an ecumenical council. And as the Pontifical Commission points out, the sentence of 1633 was not irreformable. Galileo's works were eventually removed from the Index and in 1822, at the behest of Pius VII, the Holy Office granted an imprimatur to the work of Canon Settele, in which Copernicanism was presented as a physical fact and no longer as an hypothesis. Point of view: Anti-Heliocentric (!) Robert Sungenis - Catholic Apologetics International Fourth, regarding Canon Settele, he appealed to Pope Pius VII and the pope referred the matter to the Congregation of the Holy Office. On August 16, 1820, they decided to allow Settele to publish his book. Then on September 11, 1822, the cardinals worded their allowance with the following words: "...the printing and publication of works treating of the motion of the earth and the stability of the sun, in accordance with the general opinion of modern astronomers, is permitted at Rome." This decree was ratified by Pius VII, but it was not until thirteen years later, in 1835, that an edition of the Index which contained no reference to a condemnation of works expressing the motion of the earth. The most significant fact for this discussion is HOW the cardinals worded their 1822 statement. They do not endorse Copernicanism as an established fact, nor do they suggest that they agree with works asserting Copernicanism. As far as we can tell, the Church is still endorsing Geocentrism. They only thing they state to the contrary is that they will allow works to be published that are in accord with the "general opinion of modern astronomers." Notice that they refer to the OPINION of the astonomers. As far as the Church is concerned, nothing has been proven regarding heliocentrism. It is merely an "opinion" of the astronomers of that day. Thus, citing the Settele case does not prove anything for those who think the Church has adopted heliocentrism. Both images Eaton Under Heywood Shrops UK. In a tiny church in an area of old woodland are several wooden Green Men mostly jolly and one looking suspiciously like Fat Freddy's Cat. The image on the left is from a plate in the Louvre Paris. C12 Italian in origin the foliate head occurs several times in the company of a woman hanging upside down by her feet, like the character from the Tarot pack. 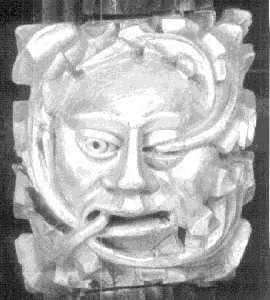 The image on the right is from Much Marcle in Herefordshire UK and is one of several Green Men in the church. Notice the Sunwheel hanging on the chain from his neck. The sunwheel is one of the most ancient symbols and also occurs on the font at Garway Common. Examples from Germany from Brukengasse 9, Limburgh - Haus der 7 Laster built 1567. They are said to be resectively Sloth and Pride since they occur with five other assorted sinful heads on the exterior of the building. I think this is a fanciful attempt by the pastors to turn a Pagan image into a Christian message. Measuring the atmospheric makeup of a planet remains one of the most powerful tools for the detection of life on other planets. Water in planetary atmospheres is not a very common thing even in our own solar system. The only planet detected so far to have it in any quantity is the planet Earth.